Many of us have collections of things that we love in our homes. Collections of art, sports memorabilia, travel souvenirs, wine, etc. can grow and may be worthy of display in a special place. 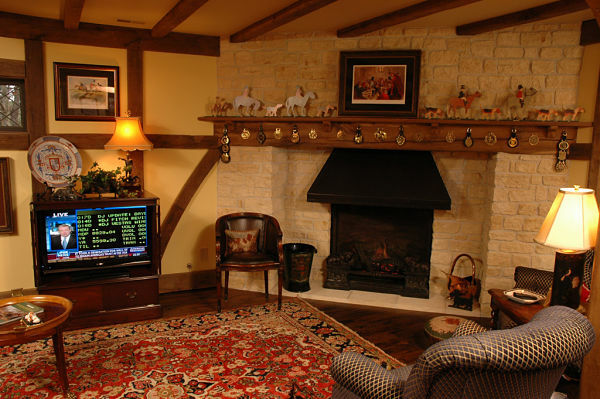 An Anderson, Ohio couple embraced their British heritage with a vast collection of English pub artifacts and antiques which lead to a unique basement remodeling project that transformed the lower level of their home into an authentic English pub. 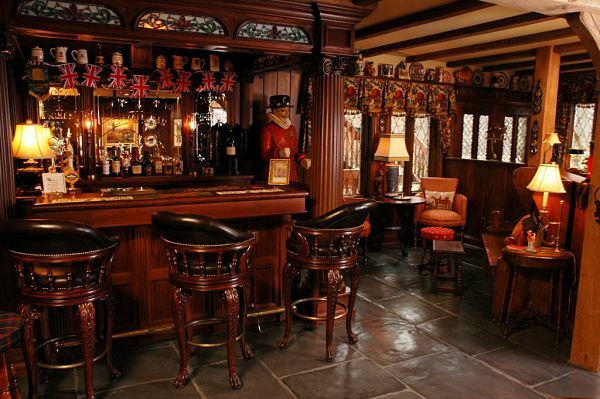 Creating an authentic English pub was one of the most interesting projects we have worked on. We were even recognized by the National Association of the Remodeling Industry (NARI) as “Contractor of the Year” for this project. 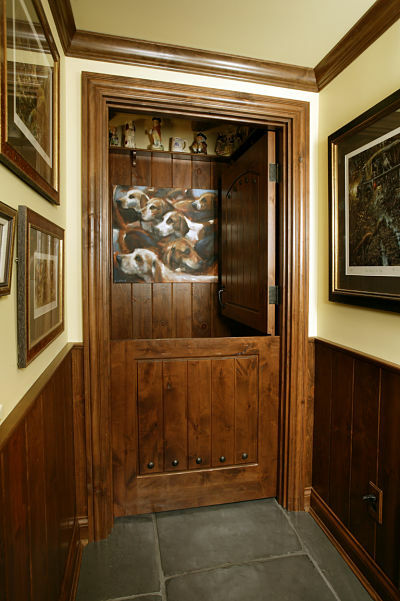 The homeowners wanted to extend the living space of their home and replicate many of the architectural elements of an English pub to display their collection of antiques and art from trips to England. They also needed functional living space for entertaining, relaxing and exercising. 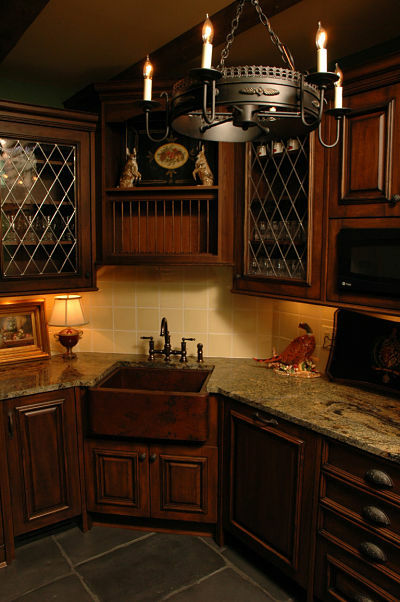 In addition to the wish list, it was important to the homeowners to create a space that would authentically replicate pubs they had visited in England. This project required special design and planning to meet the homeowners’ objectives. 1. Rework mechanicals. The home’s furnace was replaced and relocated to optimize the space for the transformation. 2. Add height to the ceiling. The ceiling was heightened by reworking the HVAC trunklines, which created space for the men’s bathroom, the exercise room, wine cellar and sitting room. 3. Rebuild the stairs. The stairs were rebuilt to improve the orientation to the sitting room. 4. 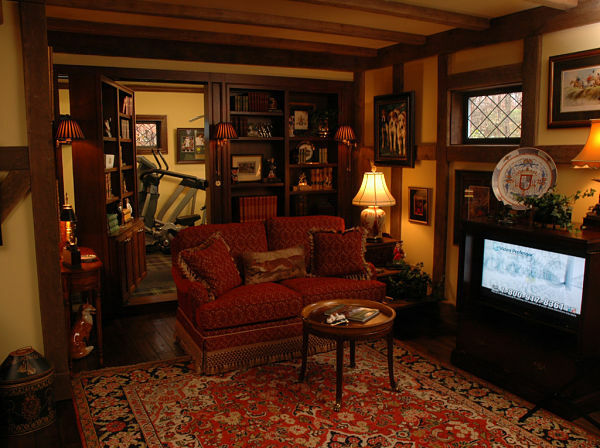 Hide the exercise room. 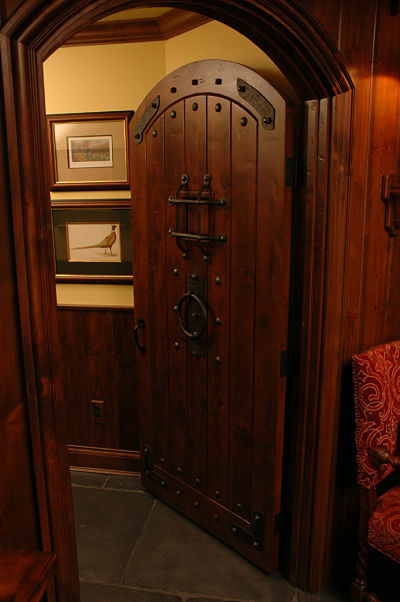 A special “bookcase” door that would fit into cabinets in the sitting room and open into the exercise room was installed to hide the exercise room from the pub. 5. Preserve the integrity of the antique bar. The mahogany bar was the first purchase for the project and was obtained five years before the remodel was initiated. It was to be the centerpiece. An adjacent prep room was designed to accommodate the appliances, sink and storage cabinetry that could not be installed in the bar area. The prep room is a fully functioning kitchen. 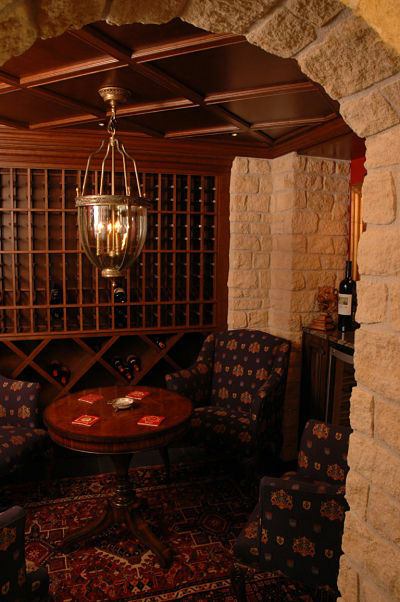 Half walls were used around the bar to create seating areas. 6. Use authentic materials. Many of the materials needed for the pub could not be found in the United States and were ordered from England. Slate flooring, wood beams, field stone, railings, glass for the bar and other items were transported by ship from Europe. Time for delivery spanned 11 weeks and impacted scheduling. 7. Help the homeowners visualize how the architectural elements selected for the project would work. Templates were created to demonstrate the actual size of features such as the wood archway and fireplace hood. 8. Display space for collectibles. A plate rail was installed to provide a place for the homeowners’ collection of British porcelain figurines and plates. 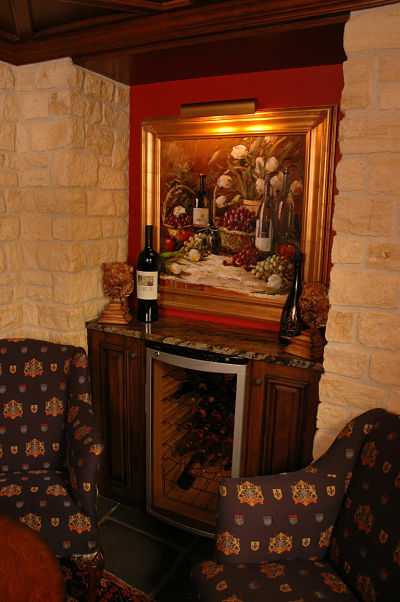 A mantel over the fireplace was also created to display collectibles. 9. Lighting. The plan for illuminating the space involved using pendants, sconces, display lighting for artwork and table and floor lamps. 10. Dog grooming. How does one fit an area for dog grooming into a British pub? Install a stall. 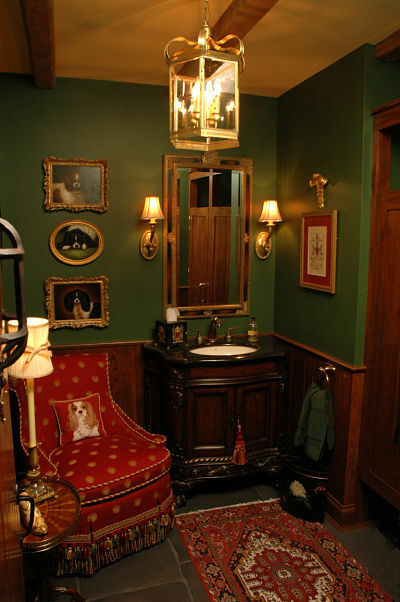 A Dutch double door creates a place for dog grooming that resembles a stable in an English manor. 11. Attention to detail. To recreate a pub and English manor style décor, every detail was important. Custom beams, columns and paneling were used throughout the project along with rounded doors with nail heads to add to the authenticity. Leaded tape gridwork was applied to six existing basement windows to create the look of an English country home.